I do not do a lot of movie reviews on the Internet Movie Database (IMDB) because if I like a movie I think that’s great, and movies are supposed to be entertaining. If I don’t finish watching it, well, then I can’t review it because I don’t like to watch crappy movies. When I do review, it is usually snarky, because I got through the whole thing and felt ripped off or offended by something.. If you have read my blog at all, you know that I have this snarky quality.. err.. from time to time. I am not offended by this film, just disappointed that Aristotle got slandered by getting the blame for Plato’s delusional rambling. During the movie the main character is explaining Plato’s “Forms” to another character, and he misrepresents the theory as belonging to Aristotle. The actor described Plato’s Forms, Aristotle did not believe in Forms. 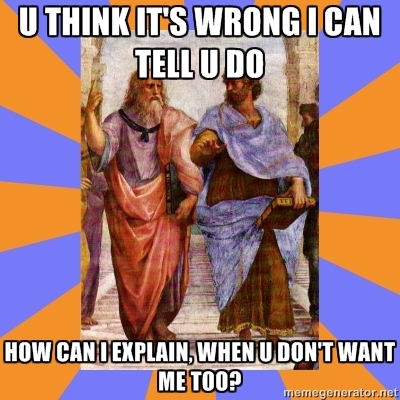 Aristotle was a student of Plato, and was radically opposed to, and argued against Plato on this. Aristotle had a completely different take on “forms” (small f) as in “hylomorphic” or derivative forms in substance, rather that Plato’s metaphysical “Ideals” in some non-seen realm, which is what the actor described. So that’s too bad. But it was a cute movie, I could have given it a 6 instead of a 5 were it not for that really bad mistake. I mean, that is -such- a major mistake, it really is, and someone’s college professor should be embarrassed. Sorry for being so nerdy, LOL. If you are looking for substantiation, get offline and go read a book. I am doing a blog post per day all month, hopefully. Inspired by NaBloPoMo. This will be a good motivation for me to format some more ebooks. This is post #3.